FINISH: Well… this is something special. Many months in the making, this finish (the third for a regular customer) has been a labour of love without a doubt. 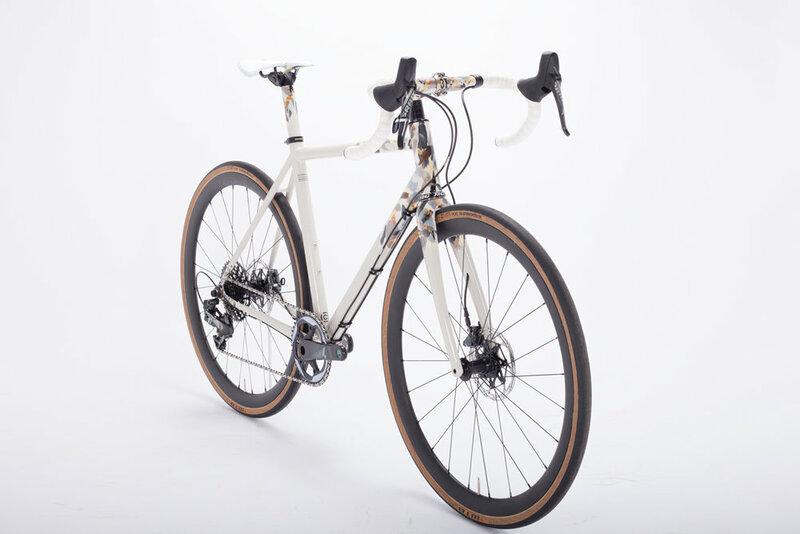 Julian came to us with an idea for a finish that would represent the Maiella mountain region of Italy, where this bike will see most of its miles. We were presented with a broad colour palette that touched on rock and mineral type hues and a number of other foliage and organic references. After some back and forth, we removed the greens and focused more on the natural stone colours so as not to over complicate the finish. Where the design was concerned, Julian is a chap with refined tastes and asked us to create something that would appear organic and ‘hand painted’ in order to reference the work of Dario Pegoretti, of which, Julian and ourselves are huge fans. This in some part conflicts with our house style and contradicts everything we’ve come to learn about creating the sharp, clean, deliberate lines we’re known for but with a little gentle persuasion and some concessions here and there, we agreed to tackle this more ‘freehand’ finish. A bit of technical knowledge to help explain the challenges on this finish. “Correct” application of colour product is done with finely-tuned, professional grade equipment which facilitates not only even coverage of colour but also, consistent distribution of solvents. Using a brush or any type of freehand flicking or splattering of products designed for spraygun atomisation can look amazing but carries with it two major issues; the first is that the product will not sit ‘flat’ on the surface of the substrate and will leave - an often visible - texture in the final surface which we consider to simply be ‘not good enough’. The second issue is the uneven distribution of solvents; building layers of product with a brush hinders solvent departure and stops the products from curing in a timely fashion. This makes for poor bonds between layers and the final finish can be weak and can even create irreversible defects as more layers are built up or clearcoat is added. With these technical considerations in mind, across a number of months, we experimented (A LOT!) and developed a masking process that allowed us to give the appearance of brush strokes whilst still ensuring all colour was applied evenly with appropriate equipment. This meant that our products could be layered whilst still remaining relatively low-build and able to cure effectively. This might seem like a minor issue but those of you reading this with any refinishing knowledge will know it was no small feat! As if that weren’t enough Julian asked us to include gold leaf in his finish, a great touch no doubt but again, brings with it another set of ingredients, each with their own technical hurdles. Many weeks were invested in building layers of “brush effect” colour, abrasive break-throughs between these layers, various types of leaf, flowcoat clears, flattening and more of the same. 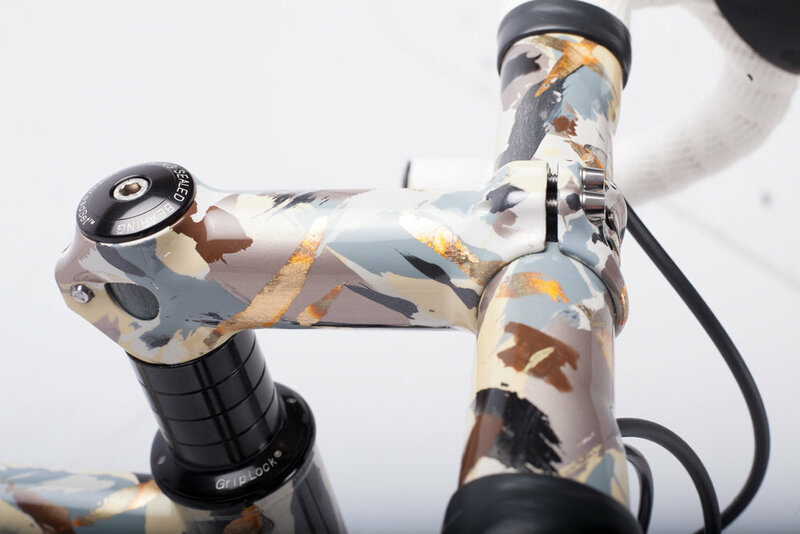 Most of the ‘action’ takes place at the front end of the bike with the bars, stem, fork, head tube and some of the top and down tubes all featuring the colour and leaf melee. 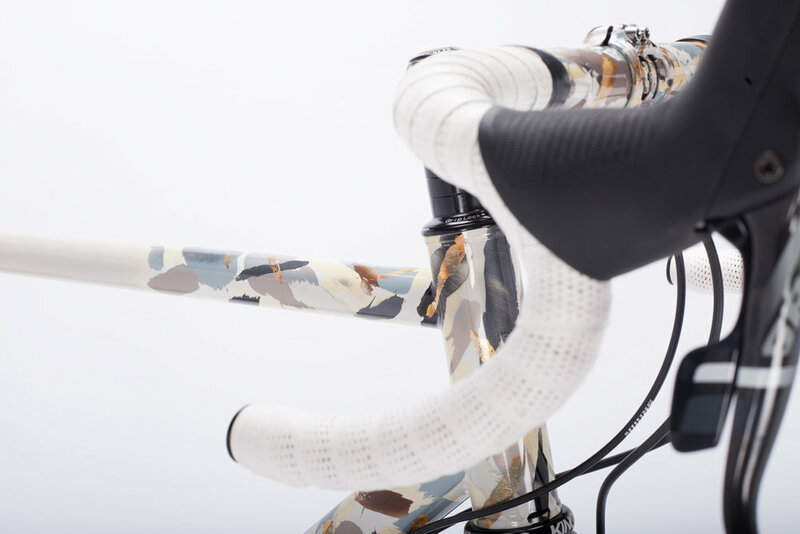 In order not to make the rear of the bike appear bare and to give some balance to the composition, we added the effect to the drive-side dropout and a colour-matched seatpost. The transitions from the brush effect into the main solid of the bike are done with very short fades in order to avoid a hard edge between the busy colour and the stark clay grey. To satisfy our own need for perfection and to create another dynamic element, we airbrushed minimal branding to the seat tube and the head tube to give some small, clean, crisp lines that contrast against the free-flowing brush shapes. Inside the Enigma badge, the model name and the CCW logo, you’ll notice a subtle textured appearance created using a technique that will remain a secret! After all colour and clear, the finish was naturally cured for a number of weeks and then finally wet-flattened and given a final flowcoat of SPI Clear and a high gloss polish so that all the layers are smooth to the touch and a uniform sheen is evident throughout. Most certainly divisive in style, this was undoubtedly the single most challenging and involved finish we’ve tackled this year and we couldn’t have done it for a better, more accommodating client. In the midst of this project, Dario Pegoretti sadly passed away and our small community of refinishers lost one if its leading innovators. We hope this bike is a fitting tribute to his ‘outside the box’ approach and we’d like to dedicate it to him; a talented creative who did whatever they liked and did it their own way.